SPARTA, Ga. – The cleansing of America’s voter registration rolls occurs every two years and has become a legal battleground between politicians who say the purges are fair and necessary, and voting rights advocates who contend that they discriminate. Voting rights groups repeatedly have challenged states’ registration purges, including those in Ohio, Georgia, Kansas and Iowa, contending that black, Latino, poor, young and homeless voters have been disproportionately purged. In Florida, Kansas, Iowa and Harris County, Texas, courts have ordered elections officials to restore thousands of voters to the registration rolls or to halt purges they found discriminatory. The 1993 National Voter Registration Act mandates that state and local elections officers keep voter registration lists accurate by removing the names of people who die, move or fail in successive elections to vote. Voters who’ve been convicted of a felony, ruled mentally incompetent or found to be noncitizens also can be removed. The U.S. Election Assistance Commission reported that 15 million names were scrubbed from the lists nationally in 2014. News21 analyzed lists of nearly 50 million registered voters from a dozen states, and 7 million more who were removed over the last year. By comparing voter registration and purge lists against U.S. Census data, News21 found no national or statewide pattern of discrimination against voters based on race, ethnicity, poverty, age or surname. But the data did show that purges disproportionately affected minority or low-income voters in certain communities, and white voters in others. In Cincinnati, poverty rates and voter removals appeared interrelated, while race appeared to affect the removal of voters in rural Hancock County, Georgia. In Vermillion County, Indiana, a shrinking population accounted for large numbers of white registered voters being removed from the rolls. David Becker, the director of elections initiatives at the nonpartisan Pew Center for Charitable Trusts, said the national pattern makes sense to him. “I think you’re finding exactly what I’ve found in my experience,” he told News21. But Michael McDonald, a University of Florida political scientist who created the United States Election Project to track election and demographic data, said he was surprised by the lack of a pattern in the national findings, although hidden patterns of discrimination can be found on the local level. “Sometimes you have to look under the hood,” McDonald said. Local election officials clean up voting registration lists under state laws governing who should be removed from the lists. Some states bar felons from voting, but they vary dramatically on which crimes disqualify voters or how quickly they can be reinstated. Some, but not all, states require elections officials to mail warning notifications to voters whose names are slated for removal. States also vary on how many elections a voter can sit out before being classified as “inactive” and later culled. Most states work together or with the federal government to compare voter registration lists to stop people from voting in two states in the same election. One in eight Americans move every year and often remain registered in two places. Few cancel their old registrations. The NVRA directed local elections officials to mail reminders to registered voters who had stopped voting in their jurisdictions to verify whether voters still live where they are registered and to establish who has moved. Those who fail to respond are placed on an inactive list and cut from voter registration rolls after one more missed election. In 2005, Kansas created the Interstate Crosscheck System in which 30 states compare registration lists for duplicate entries. When duplicate listings are found, state elections notify each other or local elections offices. It’s up to those local offices to remove those names from the voter rolls. Some do, some don’t. Pew created another name-matching tool in 2012. Its Electronic Registration Information Center has 21 state partners and compares more extensive records than Crosscheck. At least 16 states also work with the U.S. Department of Homeland Security to apply its immigration database, called the Systematic Alien Verification for Entitlements, or SAVE, to confirm the citizenship of registered voters. Some states use multiple systems to verify registrations. About 24 million U.S. voters have a mismatched name, address, signature or other clerical error on their voter registration forms, according to Pew, that can cause them to be struck from the rolls. Nationwide, there are around 10,500 state, county and local elections offices. Resources for managing elections vary widely from large urban counties like Chicago’s Cook County to small rural communities like Starr County, Texas. That accounts for much of the variety in how registration rolls are maintained. Vermillion County, Indiana, typifies why cleaning up voter registration rolls is necessary. In the two years leading up to the 2014 election, Vermillion County Clerk Florinda Pruitt scrubbed nearly 4 registrants in 10 in the small western county of corn and soybean fields. Most of the 1,191 voters were removed in the current election cycle because of death or change of address, a News21 analysis found. “We really want people to vote. We really work at it. But if you don’t want to vote, don’t register. Don’t clog our system,” Pruitt said, adding no voter there had ever challenged a removal. Indiana counties grew more assertive about culling registrations after the U.S. Justice Department sued in 2006 and the conservative group Judicial Watch sued in 2012. Judicial Watch argued successfully that Indiana had violated the NVRA by falling behind on keeping voter lists accurate. Vermillion County’s seat, Newport, boomed during World War II, when locals worked in a nerve gas factory. A peeling mural portraying GIs and aircraft winning the war covers one side of a brick building. Like the munitions plant, residents are gone now. 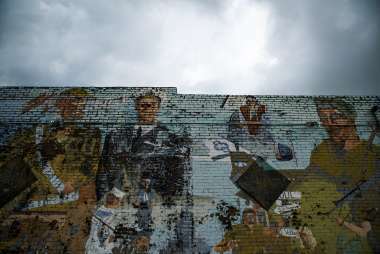 A mural depicting victorious soldiers in World War II peels with age on the side of a building in the center of Newport, Indiana. The town’s economy boomed during the war, where it manufactured nerve gas and other munitions, but many people have moved away since the fall of industry here. The decline in population is a possible explanation for the high rate of voter name removals from registration lists in Vermillion County. By contrast, few people leave Sparta, the seat of Hancock County, Georgia, where race appeared to play a critical role in a voter purge in 2015. Hancock County has the third-lowest median income in the state. Half of the storefronts on Sparta’s main street are boarded up. Last year, Sparta, whose population of around 1,300 is about 80 percent black, was about to choose between white and black candidates for mayor. The majority-white Hancock County Board of Elections sent teams block by block through Sparta looking for residents to vouch that their neighbors still lived where they were registered to vote. On the say-so of neighbors, 174 voters were listed for removal, including Dion Hubert and his brother, who’d been taking care of their ailing mother across town. 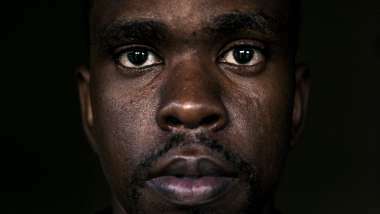 Hubert, 29, skipped work to attend a hearing at the courthouse to petition the elections board. He prevailed, but many other Sparta residents never showed up. Almost all voters purged from the rolls were black, according to a lawsuit filed later by the NAACP. The Hancock County Board of Elections declined interviews, but the county denied every allegation in court without elaboration. The case has not yet gone to trial. Dion Hubert, 29, is one of 174 voters whose names were removed by the Hancock County Board of Elections from voter registration lists in Sparta, Georgia. Hubert petitioned the decision of the elections board during a hearing at the courthouse. The court ruled in his favor and his right to vote was restored. Ohio became a target of a voting rights lawsuit after Secretary of State Jon Husted oversaw the removal of about 2 million voters in the last two years. The ACLU and other advocacy groups argued that Ohio struck names exclusively because of voter inactivity, in violation of the NVRA. A federal judge agreed with Husted, ruling that Ohio did not violate the law because voters were purged for a variety of reasons. The case has since been appealed to the 6th Circuit U.S. Court of Appeals, which heard oral arguments in late July and has not yet ruled. When Hamilton County, Ohio, where Cincinnati is the county seat, removed 75,000 voters this year, nearly half, and in some neighborhoods far more, were purged because of “non-response.” A News21 analysis found a connection between the poverty rate and racial composition of ZIP codes in the county and the purge rates of registered voters. In central Cincinnati, where the poverty rate in the Clifton Heights neighborhood is double the city’s average, Hamilton County officials so far removed 27 percent of the voters. Six miles west, in the almost exclusively white suburban Cheviot neighborhood where the poverty rate is half that of the region, the county purged 9 percent of voters. Just south of Clifton Heights, near downtown Cincinnati, Brittany Middlebrooks, 26, walked through Washington Park with a clipboard, registering voters earlier this summer. She cited Ohio’s recent purges to warn people they might not get to vote if they don’t re-register. “I feel like they are trying to do their best to get us not be able to vote,” MIddlebrooks told News21. But conservative activist groups view inaccurate registration rolls as a problem for democracy. The conservative American Civil Rights Union has sued eight counties to cleanse the rolls. A year ago the Public Interest Legal Foundation, which litigates on behalf of the ACRU, said it sent warning letters to 141 more. In January, the legal foundation said it threatened to sue 30 counties. The ACRU sued three small counties in Texas along the Rio Grande, which are overwhelmingly Latino, plus four Mississippi counties with black populations ranging from 34 percent to 72 percent. In Mississippi’s Jefferson Davis and Walthall counties, plus Zavala County, Texas, the ACRU won what it called “historic consent decrees” to compel reinvigorated purges. Sean Young, senior staff attorney for the Voting Rights Project at the liberal-leaning American Civil Liberties Union, said the renewed focus on purging registration lists is no coincidence. Election officials rely on a hodgepodge of data sources and name-matching tools to clear out ineligible voters: local death and marriage records, state or federal prison and court notices, the U.S. Social Security Administration’s Death Index, the U.S Postal Service’s national change of address database, various immigration databases, vehicle registration records and other state voter lists. The 30 states using the Kansas-based Interstate Crosscheck System match last names, first names and partial Social Security numbers to identify people who potentially have registered in more than one state. Some states include birthdays, ages or full birthdates. The service is free to member states. Pew’s ERIC system charges 21 states $25,000 a year, plus their share of annual overhead costs. Created in 2012, ERIC is managed by a nonprofit partnership comprising the states’ elections officials. ERIC adds full middle names, suffixes like Jr. or Sr., full driver’s license numbers, addresses and full birthdates to the matching software. States pay for the subscription to access more complete federal databases and promise to mail all eligible voters to remind them to register. States also can use the Homeland Security Department’s SAVE immigration database to check individuals in the voting rolls against the government’s lists detailing the citizenship status of foreigners who’ve entered the country. In 2012, Florida used SAVE to identify 180,000 mostly Hispanic noncitizens and told county elections officials 2,650 of them were registered to vote, according to court records. The Justice Department sued to halt the purge. When Latino advocates alleged that some purged voters were, in fact, citizens, they also sued in federal court. Florida volunteered to suspend its use of SAVE, recognizing mistakes. Latinos and Asians are more likely to be falsely matched with noncitizens because those cultures have fewer surnames, demographers and election experts widely agree. Nonetheless, at least 16 states, many, such as Texas and Arizona, with large Latino and immigrant populations, still use SAVE or have sought federal approval to use the database. State elections officials in Washington and Colorado, which both use Crosscheck and ERIC, told News21 that ERIC was more reliable. Colorado Elections Director Judd Choate gave Crosscheck mixed grades. “It’s the only tool for identifying double voters across states,” Choate said, noting ERIC does not yet track voting histories and “when they do, we’ll drop out of the interstate (Crosscheck) compact.” He said the Crosscheck data can be a year out of date, which makes it “kind of lousy” for keeping accurate lists and finding people who voted in two states. A Washington state audit of the ERIC system in 2014 found statistically no cases in which people who were legally registered were falsely flagged as ineligible. ERIC also identified more dead voters, Washington found. “We never took action on any of the Interstate Crosscheck, the Kansas program,” said Stuart Holmes, election information systems supervisor for the Washington secretary of state’s office. Emily L. Mahoney, Hillary Davis and Jimmy Miller contributed to this report.